Baking. I’ve never been much of a baker, but there’s something about this time of year that makes me want to put something warm and heavenly-smelling (and easy) in the oven. A couple of my favorites are Trader Joe’s beer bread and coffee cake. Apple picking. This is something I’ve always wanted to do, and now that we have little ones who would enjoy it it’s the perfect time. Julian is famous for it’s apple picking (and apple pie! ), so we’re planning a day trip soon. Decorating. 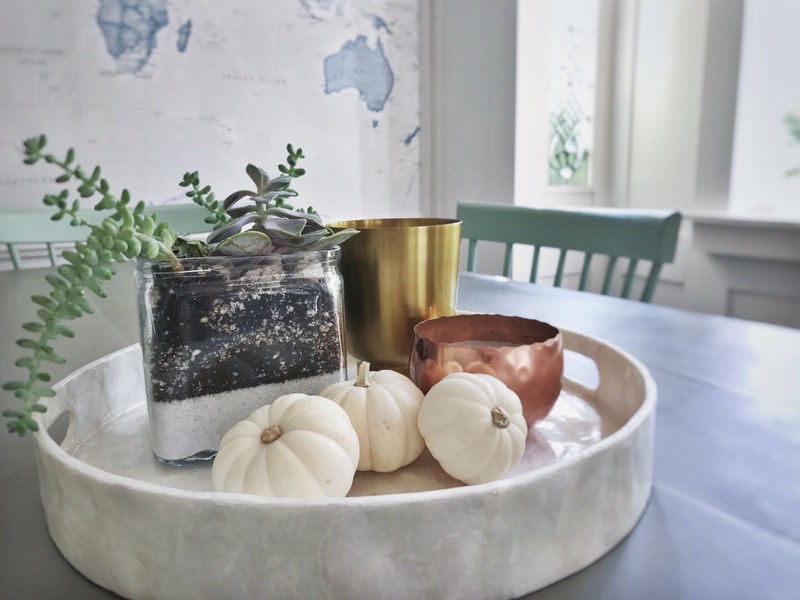 My favorite, simple go-to for fall decorating is mini white pumpkins. We don’t have a mantel or a lot of shelves in our main living space, so the round tray on the dining table is my fall decorating spot. I throw in a pumpkin candle, and I’m done! Beach bonfires. These are fun year-round, but much more cozy when it’s actually cool out! Visit the library. Since the boys are only 2 and 3, we have yet to experience back-to-school season. But the older they get the more they seem to enjoy reading, so I’m excited to take them and check out their first round of library books. Cozy drinks (of course). We make most of our coffee at home, so buying coffee out is a treat for us. I’ve been dreaming of a PSL (half the flavor shots – anyone else think they’re wayyy too sweet?) and can’t wait to indulge in one (and this cocktail). Happy Fall! How will you be enjoying the season? I love fall, too! Those mini pumpkins are the perfect autumn accent.